Kurzweil's high-quality K-series workstations have always commanded a premium price tag, but it's been a while since the range's underlying technology has been updated. Is their latest offering still competitive in 2004? When Kurzweil's K2000 first took the stage back in 1992, I felt that it represented a considerable leap forward for synthesizer workstation technology. Admittedly, no single aspect of the machine's feature list was startlingly new at the time, but Kurzweil had succeeded in bringing together a number of mouth-watering goodies into a very well-integrated package. Not only that, but the quality of the hardware, software and sample set were exemplary. Kurzweil had developed a proprietary synthesis system based on DSP building blocks which they termed 'VAST' (Variable Architecture Synthesis Technology). From the first, VAST proved incredibly powerful and flexible, with a modulation architecture that was the answer to many a synthesist's prayers. 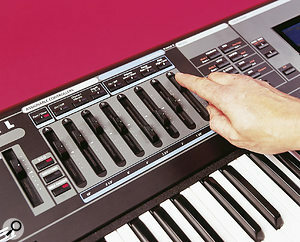 As the '90s moved on, Kurzweil continued to develop and expand the K2-series with major software updates (including a highly developed filing system and fully featured sequencer), expansion options and more advanced versions of the hardware, culminating in the K2600, released in 2000, with its choice of 76 semi-weighted or 88-note piano-weighted keyboard, faders, ribbon controllers and wide variety of controller inputs. There's no doubt that the K2600, in both its 88-note and 76-note form, is formidably large and heavy. I well recall carrying one to my upstairs studio to conduct the SOS review — phew! While this kind of bulk may not be a problem for professional musicians with a road crew to hand, to the amateur and semi-professional with live performance in mind, it may well be a strong reason for crossing the 2600 off their short list. 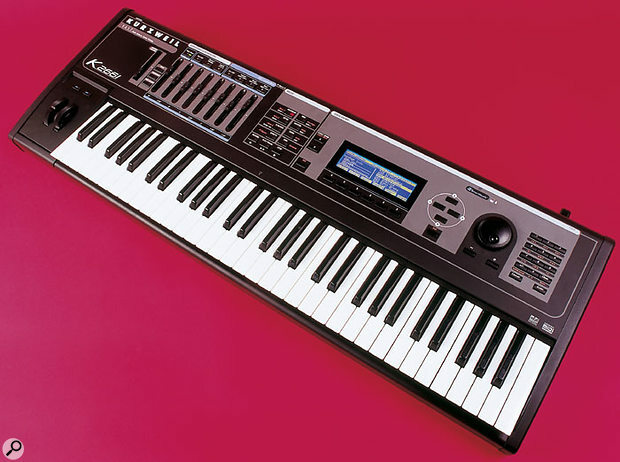 The earlier K2000, on the other hand, with its five-octave (61-note) non-weighted keyboard, was of manageable proportions and weight, making it ideal for gigging, rehearsals and generally being carried around in the back of a car. In my review of the K2600 (see SOS April 2000, or www.soundonsound.com/sos/apr00/articles/kurzweilk2600.htm), I voiced my doubts that we would see a non-weighted version (given the lack of a similar non-weighted version of the earlier K2500). It's taken four years, but Kurzweil have finally proved me wrong! So is this a case of 'better late than never'? Since the K2661 is essentially the soul of a K2600, this review will give a broad outline of its features, coupled with comparisons with the earlier K2600. For a more detailed review of the capabilities of the K2600 itself, take a look at that April 2000 review. Gone is the floppy disk drive of the earlier K2-series machines, and in comes a Smart Media memory card slot. This slot appears on the back of the unit, which seems odd to my way of thinking, but the port is internally illuminated by a beautifully eerie blue light (this seems wasted around the back too...) which makes finding it very easy! Using a Smart Media card is as easy as using any other storage device on these machines: simply go into Disk Mode and dial the device up. Given the relatively low cost and availability of these cards, I'd say this is a good move by Kurzweil. A SCSI port is still available for connection of other storage devices (the K2600 had two SCSI ports) and it happily worked with the chain of Jaz, Zip and CD-ROM drives I usually have connected to my faithful old K2000. The 2661's operating system software resides in Flash ROM and is updateable from Smart Media, over MIDI, or from a SCSI device. The assignable sliders are really handy, not to say invaluable when acting as drawbars under the 2661's built-in KB3 tonewheel organ emulation (note the footage legends under each 'drawbar').Photo: Mark EwingStill with us is the 64 x 240 fluorescent backlit display. This has not changed since the K2000 and is badly in need of an update. I can't help feeling that the power of VAST would be now better served with a screen similar to Korg's Triton — VAST is still the cream of the crop, in my opinion, and there is so much capability in here that is locked behind pokey editing screens and cryptic abbreviations. I'm convinced that giving VAST a friendlier face would win it a lot more converts. 32MB of sample ROM is provided onboard, including as standard all of the K2600's samples, Kurzweil's previously optional ROM1 and ROM2 Orchestral and Contemporary blocks and a General MIDI sample set. A further pair of 8MB expansion slots will take the total up to 48MB of ROM at maximum. The optional ROM blocks Kurzweil currently have to offer (numbered 3 and 4) are the Stereo Dynamic Piano and the recently announced Vintage Electric Pianos. It would have been nice if these were also included. The K2661 will accept a maximum 128MB of sample RAM, although at the time of the review, Kurzweil were supplying the K2661 with no sample RAM pre-installed. However, apparently the plan is to ship the K2661 with the full complement of 128MB pre-installed from April onwards for no extra cost. I'm pleased to hear this, although I have to say that 128MB still isn't much these days (even my old K2000 has 128MB of RAM in it). However, a full complement of 1.5MB of P-RAM is also included as standard, and this is arguably even more important than sample RAM. What's more, in the past it has always been inexplicably expensive as an add-on. P-RAM (Parameter RAM) holds user-created objects and those loaded from disk, including Keymaps, Programs, Setups and Sequences. Sampling is available as a cost option. It's certainly not as important an upgrade as it once was, since there are plenty of ways of getting sampled material into the K2661 without it, and sampling is arguably better done on a computer where it can be edited on a large screen before porting the samples to the synth. The sampling upgrade brings with it both analogue and digital sample inputs and permits external access to the entire VAST DSP engine. However, the sampling option is not required to edit and make use of RAM-based samples within VAST. The K2661 inherits the formidable sample-editing capabilities of the K2-series and it is fair to say would still put a fair number of dedicated samplers — hardware and software — to shame. VAST itself is more than capable of the real-time enhancing or mangling of sample material beyond all recognition. One significant new feature that Kurzweil have given to VAST is 'Triple Modular Processing'. What this essentially means is that you can 'chain' three VAST Layers together in series, passing the results of Layer 1 via an audio insert into Layer 2, and the result of Layer 2 similarly into Layer 3. This hugely increases the number of possible DSP block combinations (to something around 30 billion, according to the manual — and who am I to argue?). Each Layer can still have its own audio input, so you don't lose any voices in a Program, and there's no extra cost in polyphony either. Kurzweil have added 94 new DSP Algorithms to take advantage of Triple Mode. True to form (for Kurzweil have always been exceptionally conscientious at keeping users of older products well-furnished with updates), this new feature is also available to K2600 owners via a software update — check the Kurzweil web site for details. Editing the K2661 follows a pattern that will be familiar to existing K2-series owners. I did have a problem with the alpha-wheel, since I kept reaching for it only to find my fingers jabbing the cursor buttons. I put this down to a combination of the screen having been pushed to the right (in comparison with earlier Kurzweil synths) to accommodate the faders, and the off-putting circle drawn around the cursor buttons! Kurzweil's KB3 tonewheel organ and Leslie emulation mode makes a welcome return to my studio on the K2661. I was mightily impressed by this technology when I first saw it on the K2600, and it has lost none of its charm here. OK, so it is primarily aimed at getting Hammond sounds, but it can be pressed into other uses, and if tonewheel organs are your thing you're going to love this facility. The range of control on offer is simply mind-bending and the results can be very convincing. The faders act as drawbars, and there are enough assignable switches to set up toggles for Leslie rotor speed, percussion, vibrato and such like. Due to the processing required to achieve it, KB3 can still only be used on a single MIDI channel. K2000 sampling option: August 1993. K2000 v3: February 1995 (see www.soundonsound.com/sos/1995_articles/feb95/kurzweilk2000.html). K2500R: October 1995 (see www.soundonsound.com/sos/1995_articles/oct95/kurzweilk2500r.html). K2500/2500X: April 1996 (see www.soundonsound.com/sos/1996_articles/apr96/kurzweilk2500.html). K2000VP: September 1998 (see www.soundonsound.com/sos/sep98/articles/kurzweil_k2000.html). KDFX effects board: January 1999 (see www.soundonsound.com/sos/jan99/articles/kurzweilkdfx.159.htm). DMTi digital multitrack interface: May 1999 (see www.soundonsound.com/sos/may99/articles/kurzweildmti.htm). K2600X: April 2000 (see www.soundonsound.com/sos/apr00/articles/kurzweilk2600.htm). Whatever the cost/features ratio looks like, the rear panel of the K2661 leaves you in no doubt that this is a professional workstation. The Smart Media card slot is a welcome modern addition, but there's still ADAT interfacing and even SCSI built in as standard. MIDI In, Out and Thru are present, and the Thru socket may even be switched to act as a second MIDI Out port. On the right can be seen the blank holes where the high-impedance jack, XLR and optical S/PDIF/AES inputs to the sampler are found if the sampling option (not included on the review K2661) is installed.Photo: Mark EwingThough the loss of the ribbons is a shame, it's fair to say that you'll never be short of hardware control options with a K2661. In addition to the mod/pitch wheels, the 10 front-panel switches and the eight faders, there's provision for connecting up to four switch pedals, two continuous control pedals, a ribbon controller and a breath controller. I'm glad to see a breath controller socket; they are still a very much underexploited control source in my opinion. It worked fine with my Yamaha BC1. All of the K2661's control sources transmit MIDI. You can define the MIDI controller number of each of them on an individual Setup basis — in fact you can define many aspects of their functionality, including the range of transmitted values and initial position when a new Setup is recalled. This is fantastic for live use, and also for creating control templates for software synths and effects. Four individual analogue outputs are provided (as opposed to the eight of the K2600) with 24-bit D-A converters, and there is also a pair of analogue mix outputs. The analogue outputs are all balanced, but can also be used unbalanced (Kurzweil have apparently patented the output circuitry used in these output stages). Unfortunately, in changing the analogue outputs, they have also lost what I rated as one of the K2000's best features. The K2000 outputs were actually configured as send/return loops and it was possible to tap other instruments into the return. I used this facility to take a pair of keyboards on stage and mix them together to a single stereo output pair. I also use them in my studio to save precious mixer channels. Rats! For digital interfacing, Kurzweil have given the K2661 a pair of optical interface ports as standard. These are software-configurable as either two-channel S/PDIF or eight-channel ADAT ports at 16, 20 or 24-bit precision. This is welcome in helping to integrate the workstation into a wider studio system without compromising on either the number of available output channels or sound quality. The K2661 must act as the master clock to make use of the input port, and its sample rate is fixed at 48kHz. This is an unfortunate limitation for a system otherwise running at 44.1kHz — as is mine! More rats! It seems a shame there's no electrical (co-axial) S/PDIF port, too. The rest of the generous range of connections are visible in this shot. As well as display controls, there's provision for the connection of two continuous control pedals, no less than four footswitches, and dedicated breath and ribbon-controller connectors. There's all this, a headphone jack, and three assignable sets of stereo analogue outputs, too!Photo: Mark EwingKurzweil have created 575 programs for the K2661 utilising the capabilities of the expanded sample ROM. I admit that I'm very impressed by many of them. I'm well-used to the capabilities of VAST, but the programmers have really excelled themselves with some of this material. The Program material using the included ROM-block samples has also been re-edited and enhanced by Kurzweil from that provided when the blocks were available as add-on options. During this review I didn't have the ability to compare the original Program set with these new ones (my own K2000 doesn't have any of the optional ROM blocks installed), but I can say that the Programs and Setups continue Kurzweil's honourable tradition of being stunningly good. Whatever the K2661's faults, you're extremely unlikely to be left stuck for a decent sound of any genre. There is a wealth of sounds for all styles of music, and I can imagine anyone looking for film-score inspiration will have no problem here. I found the Roland TR808 samples particularly good, especially the kick drum, which usually suffers when sampled — whether this is down to the quality of the source samples or the D-A converters I'm not certain, but whatever it is, it works. Make no mistake; in terms of the quality and breadth of their sounds, I believe that Kurzweil are still at the top of the pile, even after all these years. The sounds just seem to leap out of the speakers and caress your ears. If you get a chance to audition a K2661, try out some of the Groove Setups and imagine weaving your own material into them — a guaranteed mouth-watering experience! General MIDI finally sees itself a permanent, selectable, feature, complete with its own sample set. Previous K2-series workstations did have the ability to work under GM, but required the loading of a specific set of Objects to achieve the trick. As with all of the K2661's sample set, the quality is superb. Confining VAST to the production of GM material would be madness, admittedly, but at least the option is there when needed — and many of us do need it from time to time. Sample library compatibility has always been an important aspect of the K2-series. The K2661 follows the norm with its ability to load library material from the Roland 700-series, Akai S1000/S1100/S3000, and Ensoniq EPS/ASR. Of course, WAV and AIFF formats are also supported, and I had no trouble loading in older K2000, K2500 and K2600 material. Kurzweil supply compatibility banks on the supplied CD-ROM, which ensures that older material will sound as close as possible to the originals (albeit with better-quality effects) on this new machine. Effects are supplied by Kurzweil's KDFX multi-channel effects processor. This is integrated into the output busses as four insert effects and a single master global effect. I had hoped that the processing power of KDFX would have moved with the times, but we are still stuck with a maximum of four PAUs (Processor Allocation Units) to share between the insert effects — and this is woefully inadequate, particularly as the number of effects using only one PAU are very much in the minority. Come on, Kurzweil! The power of processors has increased dramatically since the KDFX first saw the light of day and these kinds of restrictions seem to hail from a different age. On the plus side, the KDFX effects cover a wide range of useful ground and sound as good, if not better, than those on any workstation I've come across. A hard-copy of the familiar Getting Started manual is supplied with the keyboard, but all other documentation (and the sound library) is on the accompanying CD-ROM in Adobe Acrobat format. I can accept this as being a sensible option. Searching K2-series manuals has always been daunting — not due to inadequacies in the documentation, but because Kurzweil have a habit of providing extremely thorough coverage, making searching for answers a time-consuming process. This way, a simple search in Adobe Acrobat Reader helps you get to the item you need in double-quick time — and any errors or omissions can simply be remedied by posting a new manual on the web site. Inevitably, I haven't covered all of the features of the K2661 here, but as I mentioned near the start of this review, you can find many comments relating to the features I haven't covered here in my previous reviews of the K2-series synths. 64 x 240 backlit LCD. Up to 128MB of sample RAM (128MB is fitted as standard from April 2004). 32MB of base ROM, expandable to 48MB. Four analogue outputs, plus a main stereo pair. Eight-channel 24-bit ADAT I/O or two-channel S/PDIF I/O (optical only). Flash OS for software updates via Smart Media, MIDI and SCSI. And there lies the rub. Because I can point you in the direction of those reviews, safe in the knowledge that the K2661 offers very little that I didn't cover in my K2600 review four years ago. The biggest problem I have with the K2661 is simply that it feels like a machine that should have been introduced back in 1998. At that time it would have amazed and impressed, much as the K2000 did six years earlier — but by the standards of 2004, it seems like we're simply going over old ground. Yes, the sample ROM has increased, connectivity has been improved and we've lost the floppy drive in place of a Smart Media card slot, but I can't help thinking 'so what?' Nearly all of the K2661s features were introduced with the K2600 four years ago and even at that time, I said that Kurzweil needed to do a lot more than include previous options as standard and add a few digits to the model number. But that's essentially what has happened here. Heck, I'm even still getting the aliasing noise on the DSP waveforms — this should have been cured years ago. That said, personally I'd love to own a K2661. Why? Because it has all the features of a K2600 (with the sad exclusion of those gorgeous ribbon controllers), but has the footprint and non-weighted keyboard feel of my K2000 (my personal preference). So would I stump up that £1999 asking price? No. Sorry Kurzweil. I'm a great champion of the K2-series synths, as anyone who knows me will confirm, but I don't think they've done nearly enough this time around to justify that kind of price tag. A look at what features are available on comparable competing workstations at the same price, or for even less, backs me up here (just check out pages 176 to 186 this month for a prime example). Had the K2661 appeared 12 months after the K2600, I could have been considerably more forgiving, but I don't think I'm completely unjustified in feeling that what I should be reviewing in 2004 is the K2700, or even the K3000, with an appropriately more up-to-date feature-set. The power of a K2600 with the portability of a K2000. VAST technology still the best sample-and-synthesis implementation out there. Compatibility with older library material, as well as other formats. Kurzweil's proven commitment to providing upgrades/updates. Familiarity for previous K2-series users. Looks too much like old technology with a new hat on. Some features (such as audio input to the synth engine) require the sampling option. 48-voice polyphony is tight with full arrangements and layering. The price is high relative to the competition, on a spec that looks distinctly old-fashioned in some key areas. Looking at my pros/cons list is eerily familiar. I would have expected so much more of a new Kurzweil workstation. The lighter package and non-weighted keyboard are welcome, but the disappearance of the ribbon controllers is certainly not. The K2600, good though it is, failed to deliver any huge developments in VAST technology, with the possible exception of KB3 (although even this was an earlier optional K2500 development that was incorporated as standard on the K2600) and I'm afraid that's even more the case with the K2661, three to four years on. If you want K2600 abilities in a familiar, portable K2000-like package then this machine may be the one you've been waiting for, but don't expect anything earth-shatteringly new. K2661, £1999; SMP61 sampling option, £500; ROM3 Stereo piano ROM option, £129; ROM4 Electric piano ROM option, £200; 2661 ribbon controller, £53. All prices include VAT. Team Kurzweil Europe +45 7556 9644.